Snapshopee’S Universal Wrenches (Set Of 2 Wrench) With 2-Pc. Wrenches You Will Always Have The Right Wrench On Hand For All Types Of Nut And Bolt. Wrench Set Tackles The Jobs Of Multiple Sized Wrenches. These Universal Wrenches Suit All Nuts And Bolts From 9mm To 32mm. The Practical Tools Effectively Self-Adjust To The Size You Need And Can Be Used With All Systems Of Measurement. The Small Wrench Has A Different-Sized Head On Each End, While The Large Wrench Has A Single Large Head For Bigger Nuts And Bolts, Irrespective Of Their Size And Shape, As The Wrenches Adapt By Themselves. Wrenches Are A Efficient And Practical System Instantly Take Care Of All Jobs The Solution To All Your Problems With Taps, Valves, Pipes, Lines, Radiators, Boilers, Wheels, Etc. * 2 Universal Wrenches For All Nuts And Bolts * Lightweight And Self-Adjusting Set Fits 9mm To 32mm * Automatically Fits To The Size And Shape Of Nuts And Bolts * Efficient, Practical And Easy To Use * No Need For Multiple Wrenches With This Handy Set * Instantly Take Care Of All Jobs * 2-Pc. 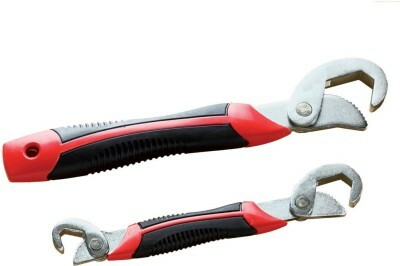 Steel Wrench Set Includes: * Small, 8-3/8″L * Large, 11-1/8″L * Both Wrench Has A Rubberized Grip.